You'll be £19.99 closer to your next £10.00 credit when you purchase Amateur Gunners. What's this? After training at St John's Wood in London and in Exeter, Alexander Douglas Thorburn was posted to the BEF in France, joining the 2/22nd London (Howitzer) Battery, Royal Field Artillery as a subaltern officer. After service in the Vimy Ridge sector, with his division, the 60th (2/2nd London) Division, he crossed the Mediterranean to join the British Army in Salonika. Following a further move in mid-1917, Thorburn arrived in Palestine where he saw service with the 74th (Yeomanry) Division during the advance on Jerusalem. A final move in 1918 took the now Captain Thorburn back to the Western Front to take part in the Advance to Victory during the closing months of the war. After the war, Thorburn wrote an account of his military service between 1916 and 1918, recording his experiences in France, Greece and Palestine as well as his initial training in England. He also wrote a series of observations on life as a gunner during the First World War. Both the account and observations were published as a book, Amateur Gunners, in 1933 by William Potter of Liverpool. Today, the book is out of print. In addition to the book, of which a small number of copies still exist of course, there are an extensive series of private letters written by Thorburn while on active service to his mother, father and other relatives. The letters are in the possession of Thorburn's only grandson. Together, the book and letters offer a fascinating insight into the life of a First World War artillery officer. Lucidly written in a candid style, Thorburn shows excellent observation, description and narration skills. 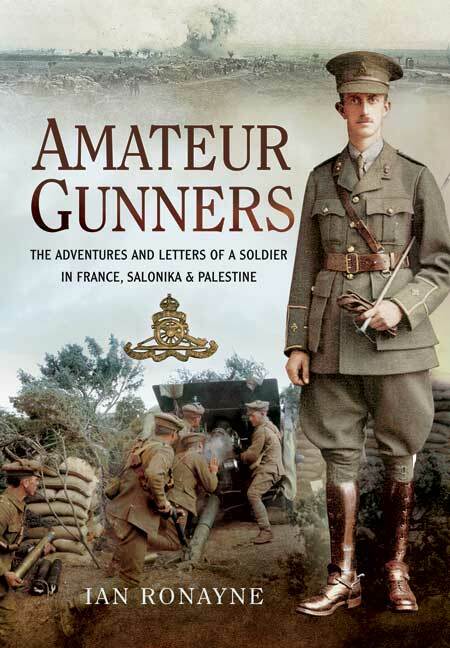 While Amateur Gunners itself is worthy of reprint, when combined with Thorburn's private letters and historical context from author Ian Ronayne, this book offers a unique look at a gunner's experience during the Great War. Combined with Thorburn's private letters and historical context from author Ian Ronayne, this offers a unique look at a gunner's experience during the Great War. Offers a unique look at a gunner's experience during the Great War. Born in 1966, Ian Ronayne was raised and educated in the island of Jersey. Now married with two children, he divides time between the demands of family, work, and an abiding passion for history. Some years back, this interest moved on to the First World War and more specifically on Jersey's participation in that terrible conflict. Today, Ian's research of Jersey in the First World War continues alongside further writing projects.